The Oxymoron HC is a collection of stories featuring the Oxymoron character created for the ComixTribe book THE RED TEN. A plethora of creators banded together and made a bunch of short stories to honour and showcase the character and I was lucky enough to be one of them. 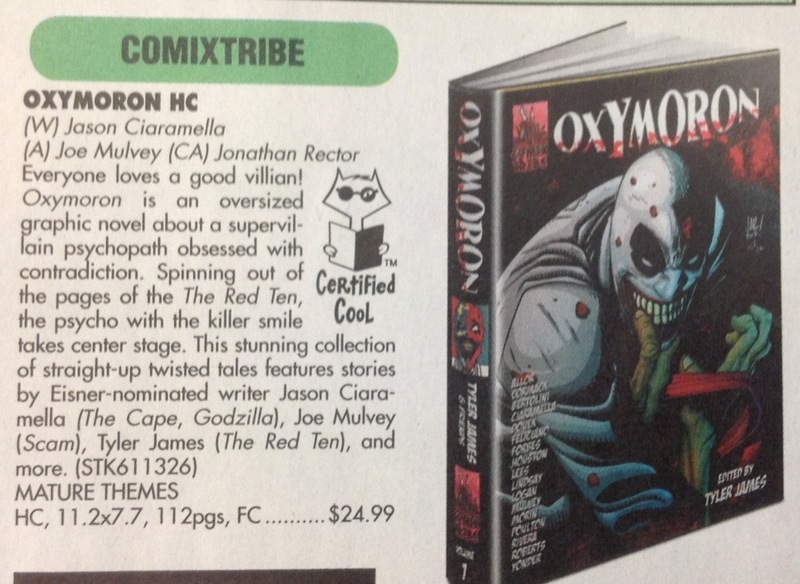 The Oxymoron HC is in April’s Previews and you can see the solicit info below. I wrote a story and my regular partner in crime Daniel J Logan made it better with his art. Paul Allor wrote what might be my favourite story in the book. Jason Ciaramella, everyone’s favourite Eisner nominee, wrote a wicked story in there. We ran a Kickstarter campaign and raised 300% of what we wanted. Your preorders are appreciated and if you still need more convincing then you can download one of the stories for free right herehttp://bit.ly/OxyLivingDead.